Our Story — Urban Flava Delivered FRESH™! How a mission became a legacy of sacrifice, love and food via family tradition, salsa & chips! Created by a mom for her youngest daughter & YOU, That Salsa Lady™ (TSL) is not simply a family owned artisan enterprise, proudly located in milwaukee, wisconsin, it is also the only black and woman owned salsa company in the u.S. Dedicated to the elimination of food deserts, TSL works to create verifiable & accessible food networks of single source growers, urban gardens, small farms, non GMO producers and more. In 2015 we transformed our 20k sf piece of land into an urban micro farm. Aptly called That Hood Ranch, because it is a ranch house in the 'hood, we instantly became the controllers of how our ingredients were grown. Knowing we had land to spare, we decided to diversify our crop by reaching out to urban food entrepreneurs in need of unique hard to find items. 2016 marked the 1st year we also grew for food businesses. From callaloo an African spinach to napa cabbage used for kimchi, we also had plots for a business growing for spring rolls. He had egg plant, yams, broccoli and more. The goal is to have an alliance resolute in the transformation of blighted communities via a sustainable replicable model. TSL does more than Make Salsa. We do our best to empower & educate as we engage those on the fringes with our great flava and flexibility of our salsa. Then, through reconnecting people to healthy affordable nutrition, salsa BECOMES THE DIFFERENCE in how people relate to food. A lifelong Milwaukee native, Angela, the founder of That Salsa Lady, has spent 30+ years in some form of business development. Humanitarian, environmental and social awareness were instilled in her and her siblings by their parents and grandparents; Traits adopted by her children as well. A graduate of the Associates in commercial real estate program, Marquette University, She worked with minority contractors, public & private officials, developers, small business owners, even community engagement through open forums & town hall sessions. Yet what most excited her was the opportunity to work alongside an urban agriculture expert who also happened to be a generational farmer; The purpose of this unique pairing was to lay the ground work for onsite rainwater usage coupled with an urban garden as part of a catalytic development. At the time, most developers had not yet fully realized the beneficial impact a correlation between urban agriculture and rental housing would bring. Loving innovation, Angela enthusiastically participated in almost anything she could delve into about urban gardening. Which is how she came to identify a system only used overseas: Play Pump. Though the play pump aspect, never came to fruition, Angela was hooked on urban gardening. The development opened in 2008. Angela so believed in the concept, she moved in. The garden soon allowed freshly planted vegetables, fruits & other items to be cultivated, hydrated by the cistern, harvested and made available to residents at no charge. Unfortunately, it seemed many residents either knew little about or were uncertain how to use what was being grown. By the third year, it appeared Angela's family was among a select few taking full advantage of the convenience an onsite garden had to offer. Something needed to be done but what? When? How? Through the viability of veggies comes a resurgence of a life worth living. The simplest solution: SALSA. During this same period Angela had transitioned from commercial development into the realm of nonprofit housing only to find herself unemployed by spring of 2011. Diligent & undeterred, Angela transformed her concerns with her sudden unemployment into her inevitable next step; a marriage between the farmer she had kept in touch with & the urban garden her family loved. By first enlisting help from family, she put her business expertise to work. To indelibly connect families of lower socioeconomic status, to healthy affordable food close to home. Angela aka The CHip CHick™ w/freshly harvested cayenne peppers, peaches & tomatoes from Walnut Way. For the idea to be fully realized, it had to be achieved by utilizing a combination of FREE produce growing at the garden, supplemented by unique ingredients and guidance from the farmer. As such, the business-urban garden-farmer alliance would be the initial step in a seamless availability of tasty, affordable and healthy snacks to those who could not otherwise find them-CLOSE TO HOME. This unique partnering of resources would prove to be irresistible for organic selections. Investing her meager savings into the business-That Salsa Lady was underway. Angela often shares a phrase she coined, "Anyone can make a dollar, few can make a difference-BE THE DIFFERENCE!" Stevey could not agree more! Stevey aka That Salsa lady is our CEO. Here she is showing off her demo skills at a local organization. 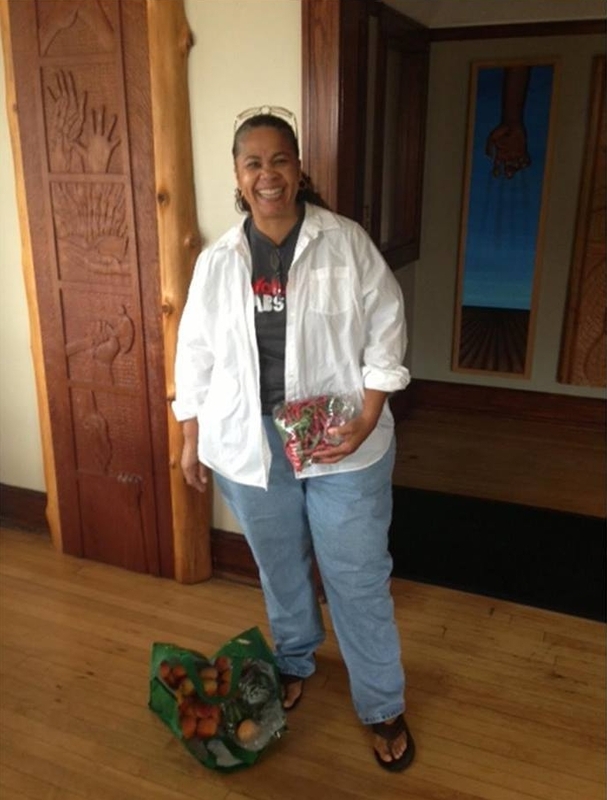 With a mission to engage, empower, educate and connect families in a manner which creates healthier, happier, more productive neighborhoods through food, Stevey stepped comfortably into the roll of That Salsa Lady; the concept she and her mom believed was possible, had begun! Picture actual CHips & Garlic Chile top, Urban Chile bottom. Stevey loves to create new salsas. The most popular is our #Avocado Salsa. It is a lighter more delicate version of #Guawk. It makes a great salad dressing, spread or veggie dip. TSL does its best to incorporate local ingredients to the selections here at home and on the road. That Salsa Lady and The CHip CHick travel the country and the globe exploring new flavors bringing them back to you as often as they can. An obvious complement to salsa are chips. Within a few weeks of opening, the ladies began experimenting with a tortilla chip concept. 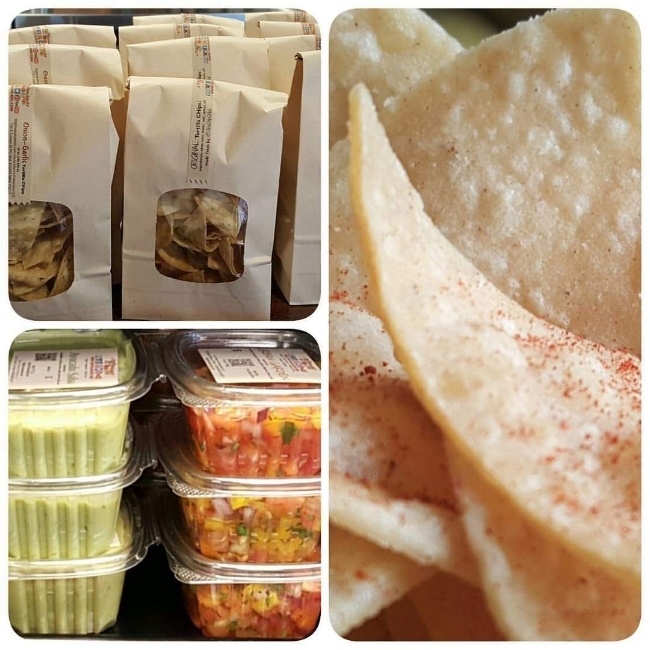 The chips were so well received TSL ultimately created over 12 varieties of tortilla chips. With the overwhelming success of the TSL chips, Angela, transformed into ‘The CHip CHick’. The CHip CHick gourmet CHips as seen in Outpost Natural Foods co-op. TSL has incorporated several unique concepts & programs. One is our barter program which allows us to trade our selections for services or products from verified vendors. Another is TSL recycles. Initially introduced in 2011, TSL has re-engaged the effort with a connection to savings. Upon clean return & subsequent reuse, our glass jars allow perks, to customers actively Participating. TSL Loves LOCAL! When available, most of our ingredients are grown locally. We utilize farmers markets, urban gardens, single source growers and limited grocery items. Most importantly TSL has a network of food folks guiding us in our efforts to grow great food. Always happy, no matter the season or event, Wade routinely welcomes you with a smile as long as you have QUESO that is! He eats it with a spoon. He thinks tomatoes are candy. Wade is the 1st in 4 generations to grow up farming! Since 2014 we began converting our enormous back yard in a working urban garden Farm, to grow the many items essential to making our Gourmet salsas. In 2015 That Salsa Lady added 15+ in ground plant beds, rain barrels and unique plantings bringing us a bit closer to being a complete closed loop system. TSL also has a Signature Selection which features higher end items such as Spinach Dips, Margarita Salsa made with authentic Tequila, Mexican Corn salsa, Guacamole, Pesto and Chile. Everything on our menu can be ordered in larger quantities. We encourage you to call us for business meetings, luncheons, parties, celebrations, weddings, receptions, graduations, baby showers, picnics, etc. TSL actively stays connected to residents. We participate in local events, committees, etc. We are always looking for more so PLEASE GET US DETAILS <(click then scroll down) on where you want us! Accessibility to healthy fresh foods is not easy, is most difficult. With that in mind, That Salsa Lady not only participates in local farmers markets, TSL also delivers! Though a nominal surcharge may apply, deliveries are always FREE to urban neighborhoods. It has been said "TSL Delivers cuz veggies don't Drive!" Top to Bottom: Urban Garden, Avocado, Simply Salsas and Garlic Chile. Also picture, @TheCHipCHick original Tortilla CHips. 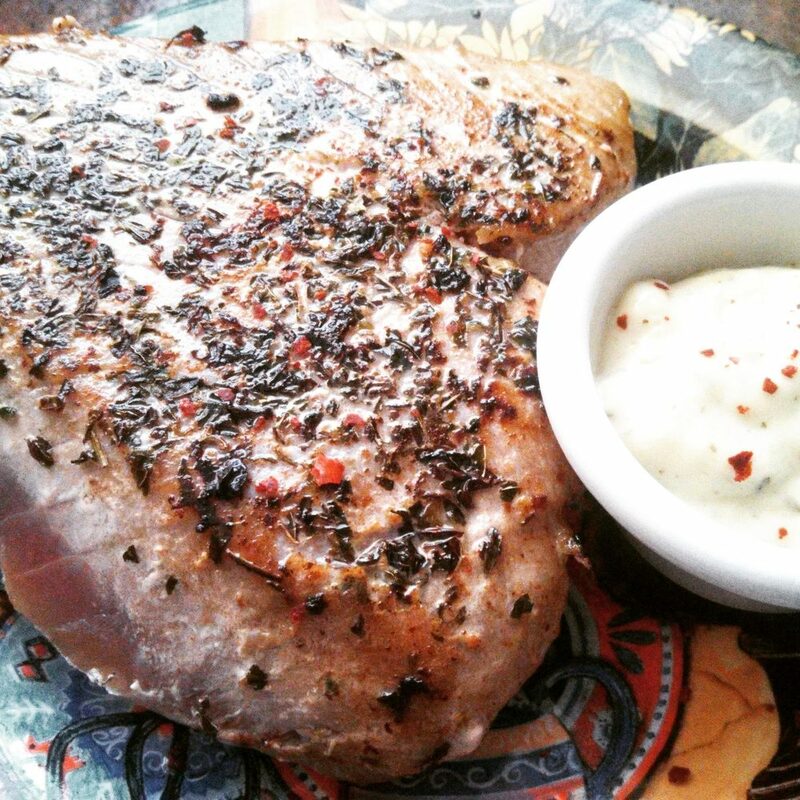 Grilled Tuna w/Tartar sauce using our urban Garden salsa, just one of our many Recipe ideas: Try ours! Share Yours! To help you incorporate TSL snacks you love into every day meal plans, That Salsa Lady routinely tests recipes using our selections. Did you know TSL can be enjoyed from Grits to Gazpacho? Check 'recipe ideas' here or on FB for details. It is our hope by making healthy foods both accessible and affordable, the creation of That Salsa Lady will ultimately act as a pinnacle in the reduction and/or elimination of food deserts.